Thank you to Norman and Jane for providing the following information. Laura Elizabeth Young (nee Marshall) from Little Henham Hall was my great grandmother writes Norman, who conducted this research. William Marshall (c 1793) was one of four children of Thomas Marshall (b 1763/4) and his wife Elizabeth (nee Franklin) (b 1770/1771). They lived and farmed at Bury Farm, Bamber's Green, Takeley, their other children were Mary Marshall (c 1788), Elizabeth Marshall (c 1791) and Thomas Marshall (c 1797). In 1825 William Marshall (1793) married Hetty Bright (1801) at Henham. She was daughter of John and Jane Bright of Henham. Laura Elizabeth Marshall (1834) was the youngest of four children of William and Hetty of Little Henham Hall. Her siblings were Jane Marshall (1826), Charles Marshall (1828) and Dan Marshall (1829). They lived at Little Henham Hall where William was tenant of landowner Radcliffe Pearl Todd and also of a further 35 acres of landowners ‘Almshouse Trustees of Saffron Walden’. Hetty Marshall (nee Bright) (37) died in 1838 and is buried in Henham Parish churchyard [gravestone 083]. This left the four children, aged between 12 and 7, motherless. By 1841 Laura was living away at school in Bishops Stortford. Their father William (53) died in 1846 and is buried alongside his wife. According to William Marshall's will, Little Henham Hall was held by him on lease (from the Manor of Henham Hall) and this leasehold was to pass in due course (via his executors) to his eldest son Charles Marshall when he became 21. The rest of his estate was to be sold and the residue shared between his children. By 1851 only Laura was still living at home with her brother Charles and their housekeeper Fanny Phillips. Jane Marshall (22) married butcher Thomas Chamberlain (23) of Bocking, Braintree, in 1848. They were soon running their own butcher’s shop at Great Saling where their son Marshall Thomas Chamberlain. was born in 1852. They moved back to Bocking and had two more children, Helena Augusta (Ellen) Chamberlain (1858) and Hetty Mary Jane Chamberlain (1858). By 1868 Thomas and Jane had moved to Croydon where they set up as butchers and had another daughter, Edith Laura E Chamberlain (1868). Thomas Chamberlain (74) died in 1900 at Croydon, and his widow Jane Chamberlain (nee Marshall) (87) died in 1914 at Brighton, Sussex. Dan Marshall (24) married Elizabeth Chamberlain (23) in 1855. She was from the same butcher’s family as his sister Jane’s husband. 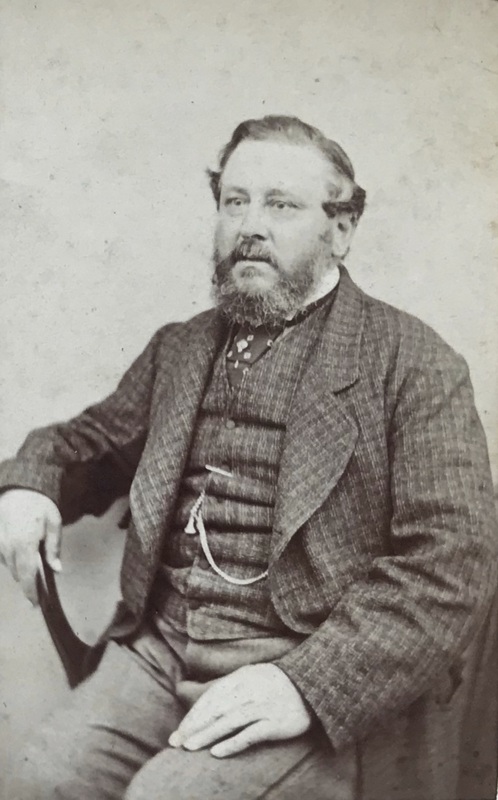 By 1856 Dan had set up as a butcher in Stebbing, where the first three of their children were born, Alice Mary Marshall (1856), William Charles Marshall (1858), and Woodleigh Emma Marshall (1860). In 1860 Dan sold his butcher’s business and took over the remaining six years of tenancy at Dunmow Farm, Dunmow (and possibly also of White House Farm, Stebbing) following the death of current tenant William Wright. At Dunmow Farm Dan and Elizabeth had four more children, Florence Maria Marshall (1862), Laura Elizabeth (aka Nora) Marshall (1864), Herbert Ernest Marshall (1867) and Kate Jane Marshall (1869). 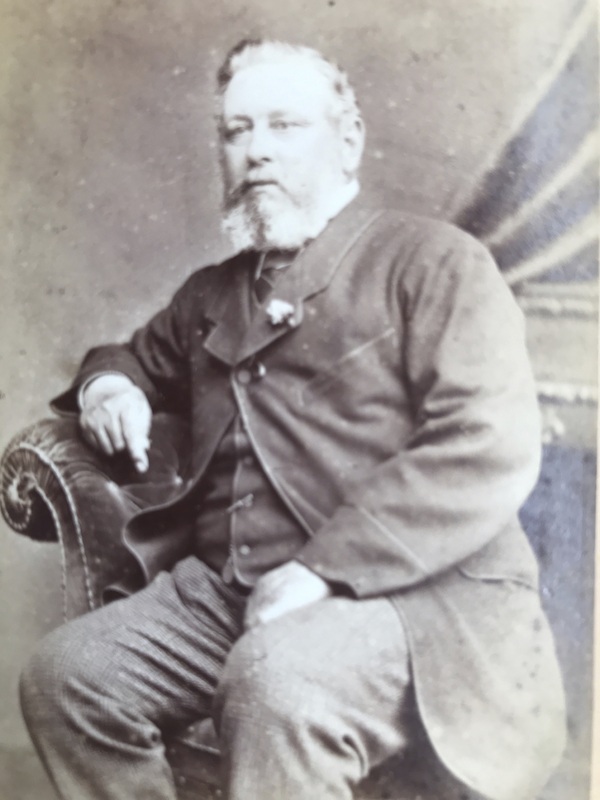 Dan Marshall (55) died suddenly in 1883 and his widow Elizabeth continued to run the farm with her second son Herbert (16), the older son William having already emigrated to Australia. Dan’s widow Elizabeth Marshall (nee Chamberlain) (86) died in 1915 at The Causeway, Dunmow. She is buried with Dan in Dunmow parish churchyard. In 1859 Laura Elizabeth Marshall (28) married veterinary surgeon and farmer Thomas Young (25) of Ford Farm, Dunmow. He was a son of veterinary surgeon and farmer Solomon Young and his wife Hephzibah (nee Brown) of North End (Great Waltham). Laura and Thomas had two children - Annie Young (1861) and Harry Ashley Young (1862). 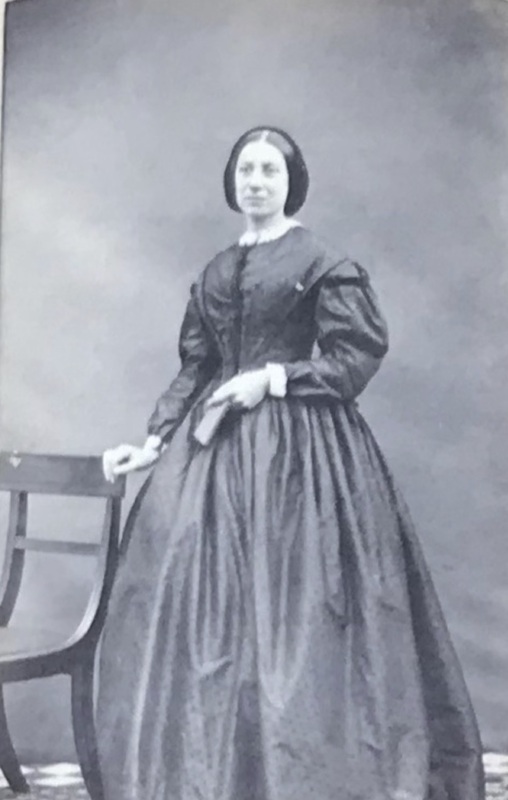 However their mother Laura (32) died in 1864 and was buried in Dunmow parish churchyard (gravestone not yet found), leaving the children aged about 3 and 2 and motherless. Thomas’s sister Hephzibah Young (30) then became foster mother and housekeeper until 1872 when she left to get married. Her replacement, Priscilla Moore, was the youngest of eleven children of farmer Simon and Nancy Moore of Swan’s Hall, Hawkedon, Suffolk. Thomas (50) married Priscilla (49) in 1883. Thomas Young (69) died in 1902, and his widow Priscilla Young (nee Moore) (92) died in 1927. They are buried together in the churchyard of the former Congregational chapel, New Street, Dunmow. 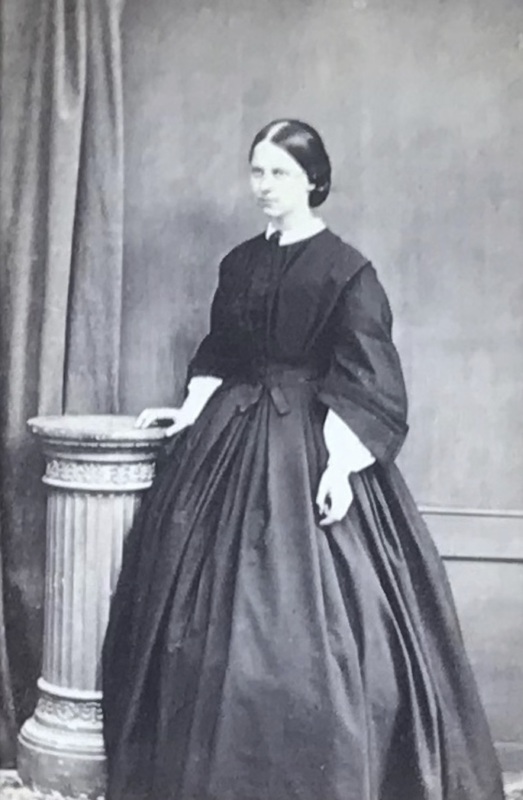 Annie Young (22) died in London, but her brother Harry Ashley Young became a veterinary surgeon (MRCVS) and in 1888 he married Belle Jesse (Bella) Farley. She was a daughter of tailor William Farley and his wife Ann (nee Blackler) of Totnes, Devon. Ashley had already built a substantial house on the Causeway, Dunmow. They had four children, Gladys Laura Young (1889), Thomas Ashley (Tom) Young (1892), Leonard Robert (Bob) Young (1898) and Charles Edwin Young (1899) (who became my father). Charles Marshall (35) married Mary Ann Bush (25) in 1863. She was daughter of James and Mary Bush of Bacon’s Farm, Henham. Mary Ann moved to Little Henham Hall. In 1870 the farmhouse and some of the outbuildings there were rebuilt by the current landlord Joseph Baxendale. Charles and Mary Ann had seven children but all four of their sons died young - William Bush Marshall (1864), Charles Chamberlain Marshall (1866), George Jackson Marshall (1869) and Ernest Willis Marshall (1871). Their three daughters were Beatrice Mary Louisa Marshall (1868), Blanche Eliza Annie Marshall (1872) and Mabel May Marshall (1875). Mary Ann (41) died in 1879 and the children were then cared for by housekeeper Maria Holmes from Saffron Walden. By 1881 the two older girls were living away from home at a girl’s school in Saffron Walden. As a member of the Shire Horse Society, Charles Marshall’s horses were recorded in the stud book, each one perpetuating the village name - probably the best known being ‘Henham Lord‘. [Newspaper article 21st Sept 1900]. In 1896 the entire freehold manorial estate of Henham Hall and its attendant farms (including Little Henham Hall) were purchased by William Fuller Maitland of Stansted Hall who then became the new lord of the manor. By 1901 all three sisters had left home and were living at Pennington Hall, Henham. But it was not long before developments took all three sisters away from Henham, and by the time of the land survey for the 1910 Finance Act only the sisters’ ownership of Bacon’s Farm with 33 acres of land remained of the Marshall family in Henham. They had inherited it from their mother’s family (Bush). In 1918 the two surviving sisters purchased the copyhold part of their Bacon’s Farm (from the manor of Henham Hall) and eventually sold the farm to Luther William Norman of Stansted. In 1902 Blanche Marshall (30) married her first cousin Herbert Marshall (34). He was son of Dan Marshall, brother of Blanche’s father Charles Marshall. The new couple lived at Dunmow Farm and Herbert became tenant after his mother moved out. They had no children, and in 1937 Herbert and Blanche retired to Stebbing where he died in 1941. His widow Blanche Marshall (nee Marshall) moved to live with her recently widowed sister Mabel, eventually at Banbury, Oxon. Blanche (85) died there in 1958. Meanwhile the eldest sister Beatrice Marshall remained unmarried, and after living at Dunmow Farm with Blanche and Herbert, Beatrice (43) died in London in 1911. In 1905 the youngest sister Mabel Marshall (30) married builder Albert Thomas Kimberley (c27) from Banbury, Oxon. They had three sons, James Marshall Kimberley (1906), Hubert Wray Kimberley (1910) and Henry John Kimberley (1915). Albert (62) died at Banbury in 1941 and his widow Mabel then lived with her widowed sister Blanche, eventually at Banbury. Mabel Kimberley (nee Marshall) (82) died there in 1957.